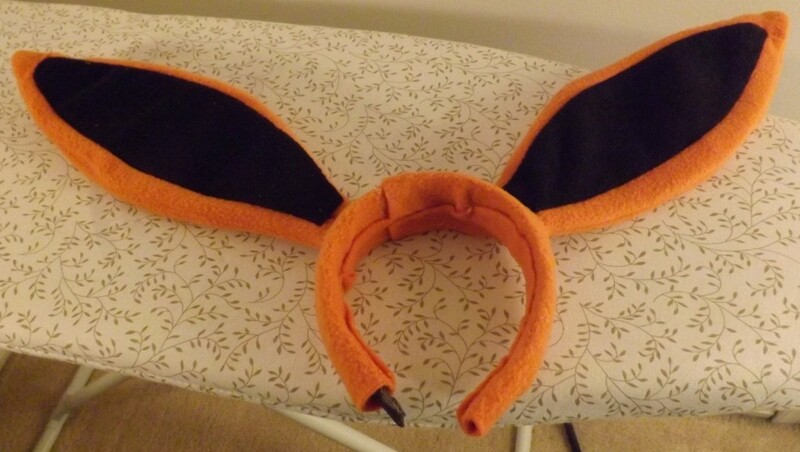 My second PAX East cosplay is going to be a Flareon cosplay inspired by Twitch Plays Pokemon. My partner is a gym leader in the PAX Pokemon League, and I’ve been a gym leader in the past, so I thought it would be a fun costume to wear while hanging out with the League folks and all the challengers. 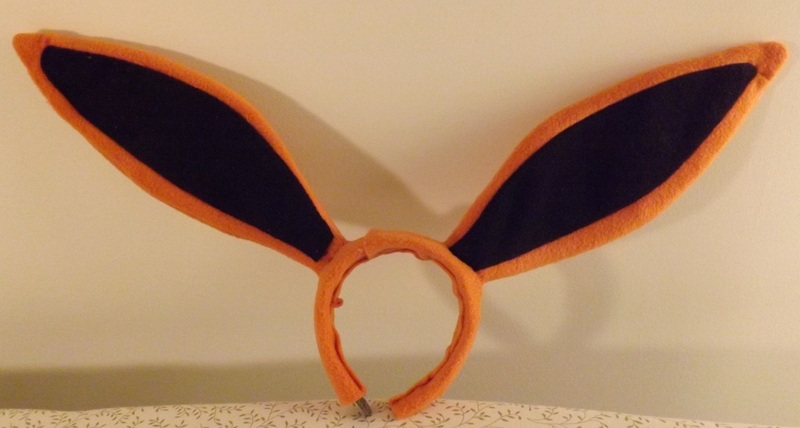 The first step was to make some cute Flareon ears! After doing a lot of research, I wasn’t very satisfied with a lot of the tutorials I found, so I went about it my own way. Supplies: Orange fleece, black fleece, a headband, hot glue, orange thread, plastic-coated gardening wire. Next, I used the paper template to cut out four ears from orange fleece and two from black fleece. I cut out the inner ear from two of the orange pieces and sewed in the black inner ear. Then I sewed each black-and-orange piece to a solid orange piece right-sides-together, then clipped the curves/tip and turned it inside out. The headband I used was olive, so to cover that up, I cut a strip of orange fabric as long as the headband and a couple inches wider. I cut two slits in the fabric big enough to fit the wire ear frames through and pulled the fabric onto the top of the headband, the wire frames sticking out through the holes. (Or at least, ideally I would have done this; as you may be able to tell from the photos, I actually messed up the spacing of the slits for the ears and ended up having to do the headband cover in two pieces. Whoops.) Then I hot-glued the edges to the under-side of the headband. Lastly, I slipped the fleece ears over the wire frames and hand-stitched each one to the cover fabric. Not bad for a first try, in my opinion!